When an oversized load struck the Danekas Bridge overpass on I-90 near Ritzville on July 10, it had far-ranging effects. The overpass at the Tokio interchange is an important stretch for both local travelers and cross-state I-90 traffic. Left: A look at the damage caused to the Danekas Bridge overpass when an oversized truck struck it earlier this year. Right: Crews work through the night to construction a new overpass span after demolishing the damaged overpass. It's also a vital link for the local farming community, who use the bridge to haul their harvest to the local grain elevator. That's why we were so excited to reopen the bridge on Monday night, Oct. 29, more than a week ahead of schedule. When the oversized vehicle struck the bridge, it damaged the entire eastbound span, forcing us to limit traffic to just one lane of alternating traffic on the overpass. Because the bridge is a key link for both local and farming traffic as well as regional travel, Gov. Jay Inslee signed an emergency proclamation to qualify for federal funds for expedited repairs, estimated to cost more than $500,000. Contractor N.A. Degerstrom of Spokane was awarded the contract and work began on Oct. 1. The biggest and most visible part of the job was demolishing the bridge span and rebuilding it. Crews also had to reinstall the railing and pave the bridge deck. 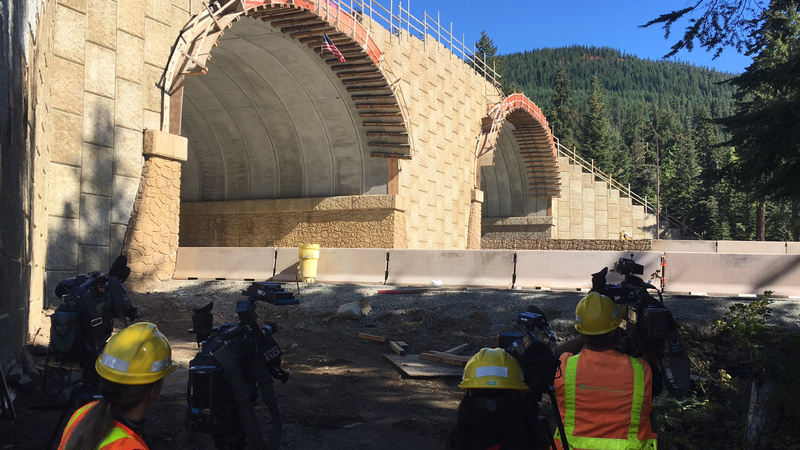 Demolition of the damaged bridge span was completed in 36 hours to limit disruption to traffic on I-90. The repairs required three closures of I-90 through this area. Two were 36-hour closures to demolish the bridge and replace the span. The third eight-hour closure was to remove materials to speed up the early re-opening of the overpass. Just 29 days later, the bridge reopened and the job came in on budget and a week earlier than scheduled. Our photo album has some great images that chronicle the work. While we're pursuing reimbursement costs from the freight hauler that hit the bridge, we would prefer not to have had to fix it at all. overpass was constructed and opened a week earlier than scheduled, and on budget. Please remember that by law, it's up to the operator to know their vehicle height as well as bridge heights along their route. Our online bridge vertical clearance trip planner tool provides a way to map a route to be sure you're safe and legal to reach your destination. We extend a big thanks to N.A. Degerstrom for their fantastic work on this important job. Also thanks to Oldcastle Infrastructure of Spokane which prioritized fabrication and delivery of the slab girders in six weeks (normally this takes 12 weeks from order to delivery). Without that effort amongst a busy workload, we wouldn't have been able to get this done before winter. And finally a tip of the cap to the travelers who had to adjust their plans during I-90 closures to get this work done. It was a great team effort and we're excited to have this project complete and traffic restored. 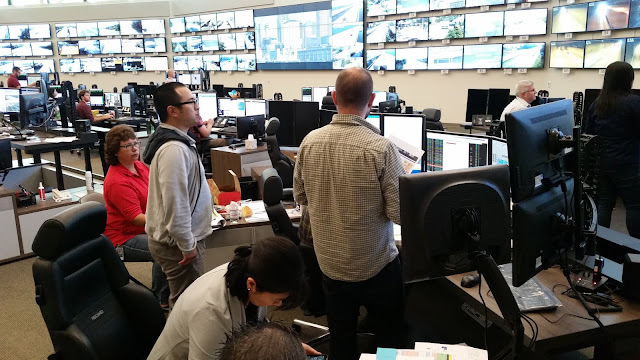 A real earthquake would be a hair-raising event, but luckily, the only hair really raised in last week's Great Washington ShakeOut were the trolls in our bridges. While all of our agency practiced "Drop, Cover and Hold On" during Thursday's earthquake drill, our Northwest Region added some extra effort – and flair – to their post-drill activities. And, believe it or not, troll dolls played a starring role. 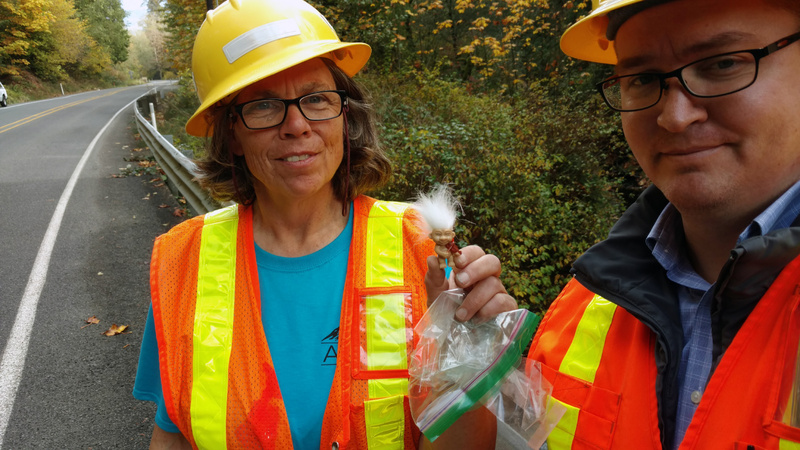 a post-ShakeOut drill bridge inspection in Skagit County. For the first time, the region's project engineer staff practiced Level 1 post-earthquake bridge inspections following the ShakeOut. After a real earthquake, these initial inspections would be one of our first actions after accounting for all of our staff. The quick inspections – roughly 10 minutes – are to identify collapsed bridges as well as others that will need further inspection by specially trained bridge damage inspectors before vehicles return to the bridge. Using engineers from outside the Bridge and Structure Office allows our Emergency Management officials to quickly gain situational awareness and plan response and recovery efforts. It also allows us to deploy our limited number of bridge inspectors most efficiently. Crews in King, Skagit, Snohomish and Whatcom counties broke into teams and traveled 14 pre-identified bridge inspection routes. 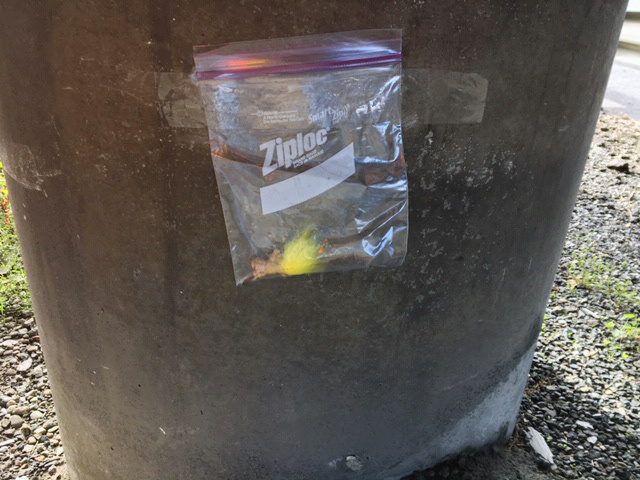 Instead of quake damage, drill organizers hid small troll dolls on one bridge along each route. practice looking for damage on bridge structures after the Oct. 18 ShakeOut drill. Each doll – three inches tall including hair -- was placed in an area that should be checked during the initial visual inspections. Teams had to provide a photo of their bridge troll to complete the bridge inspection paperwork. The results? Crews on 10 of the 14 routes found their troll (we believe the four others were discovered by others and "liberated" before our crews got there). But even the teams that came back troll-less got valuable experience driving the inspection routes. A green-haired troll can just barely be seen on the side of a bridge during the post ShakeOut bridge inspections drill. The trolls were a fun addition to the drill and make for some great pictures. But the real reward is knowing the region is better prepared for when a real emergency strikes. When will it all end? That's the number one question we get about highway construction in Tacoma. It is usually followed with, "You've been building and re-building I-5 at SR 16 for 20 years!" Yes, it is true. We have been building the Tacoma/Pierce County HOV Program for close to 20 years. The program is made up of 17 projects that started back in 2000. Each project built the foundation for the next. Fast forward to the end of 2018, and we are down to the final four projects. Two of those are in their final weeks of construction. Yes, you read that correctly - weeks. Left: 2014 aerial photo of Interstate 5 in Tacoma, before construction. Right: 2018 aerial photo of Interstate 5 in Tacoma, showing a widened I-5, new bridge over I-705, a new Pacific Avenue overpass and new McKinley Way overpass. In the first two weeks of October, Max J. Kuney Construction, the contractor who is building the East McKinley Way overpass, has put both directions of I-5 into its final configuration within the project limits. The ramp from eastbound SR 16 to northbound I-5 now has two lanes for travelers to use instead of one. Not only did this project widen I-5 to make room for HOV lanes, it replaced all the original concrete with a new roadway surface, rebuilt the Pacific Avenue overpass and built a new bridge over I-705. These photos from 2014 and 2018 show the dramatic before and after. Another project that began in 2015 that is wrapping up is the northbound I-5 HOV project that widened I-5, built a new Puyallup River Bridge and a new ramp to SR 167. Contractor crews working for Hamilton Construction are finishing landscaping, striping, and an improved storm-water system. 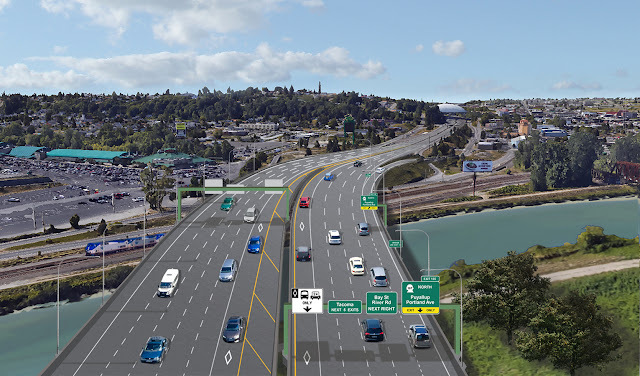 Travelers will get a few weeks' reprieve before contractor Guy F. Atkinson Construction begins work on widening the last section of I-5 in Tacoma and building a new southbound I-5 bridge across the Puyallup River. by the design-build contractor, Guy F. Atkinson Construction. 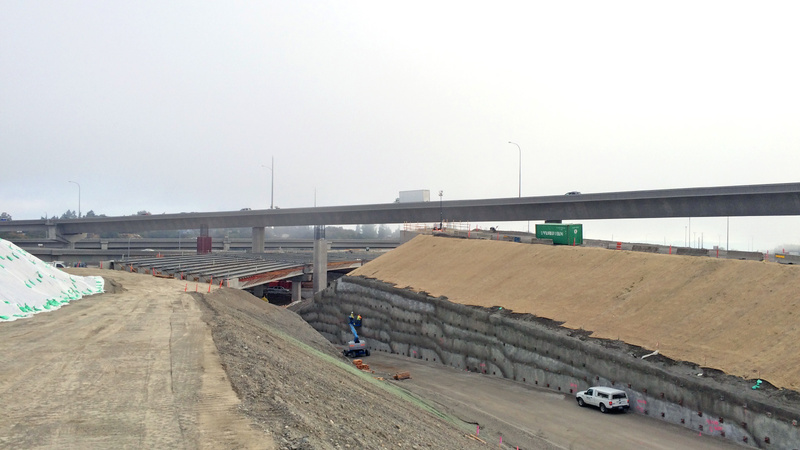 For most I-5 travelers, it is hard to see exactly what design-build contractor Skanska is doing at the I-5/SR 16 interchange. Most of their work is taking place west of mainline I-5, out of sight for most travelers. Crews are rebuilding the alignment of southbound I-5. 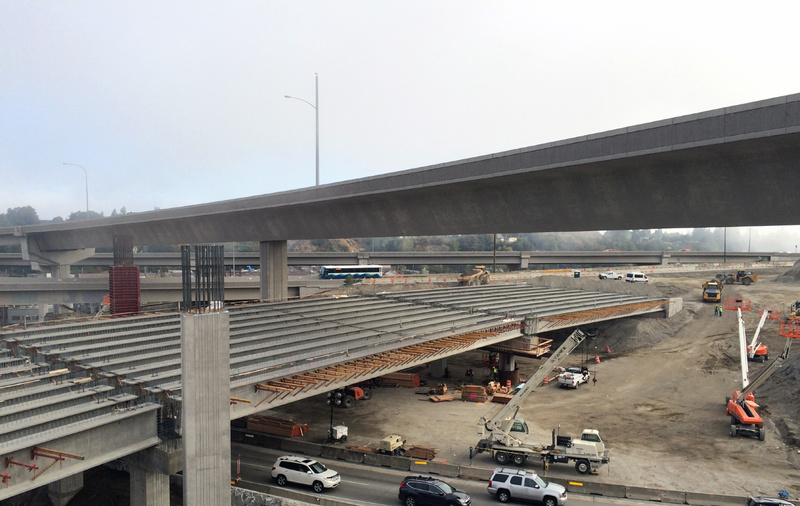 In recent weeks, they installed 30 new bridge girders for new overpasses that will carry new lanes of southbound I-5. Crews are also building new bridges that will connect HOV lanes between SR 16 and I-5. To do this work, this past May all lanes of southbound I-5 were moved into a temporary configuration adjacent to northbound I-5, separated by barrier. Weather permitting, the contractor anticipates that southbound I-5 will be in its permanent alignment in spring 2019.
shows the new southbound I-5 overpass above the eastbound SR 16 ramp to northbound I-5. Here is a look at the new eastbound SR 16 HOV ramp to southbound I-5. We recently announced a delay in the work at the top of the South 38th Street east loop ramp that would allow travelers to go east or west on South 38th Street. The new schedule shows the work occurring in early 2019, after the holidays. The delay won't affect the overall project schedule. Skanska anticipates the project to be complete in mid-2019. That means a year from now, fingers crossed, there will only be one active HOV construction zone on I-5 in Tacoma. As always, our best advice is to know your alternate routes and check the construction schedule posted at www.TacomaTraffic.com before you head out the door. Give yourself extra travel time. Also, be sure to use the WSDOT app for current traffic conditions. and they're all excited for ESPN's visit to Pullman this Saturday. 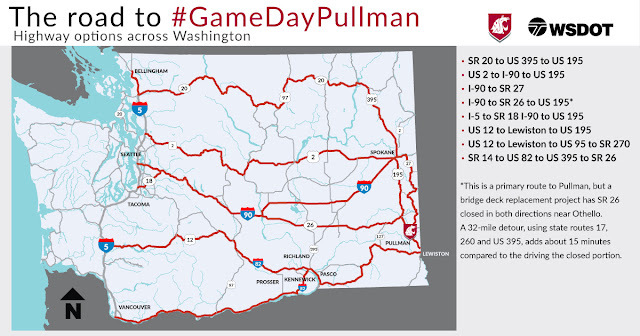 A Crimson and Gray wave is headed to Pullman Friday night and Saturday morning as ESPN's Gameday broadcasts from Washington State University. So, anyone traveling in the area should be prepared. For those of you who don't bleed crimson and gray, Saturday's broadcast is the culmination of a 15-year campaign – 15 years! – to bring the popular football preview show to Pullman. As part of those efforts, a traveling WSU flag named Ol' Crimson has appeared at 216 consecutive Gameday broadcasts across the country. The flag is express mailed to each week's location by a band of Coug alumni and boosters who chronicle the efforts on Facebook and Twitter. This Wave the Flag movement has become an intense source of pride for Coug fans. Fans heading to Martin Stadium in Pullman this weekend should expect heavier than normal traffic both on the trip over and on Pullman streets as ESPN films there early Saturday morning and the Cougs play the Oregon Ducks in the afternoon. So, as soon as ESPN finally made Coug dreams come true, WSU fans from all over began scrambling to get to Pullman. The 4:30 p.m. football game pitting No. 25 WSU against No. 12 Oregon is sold out and every hotel room on the Palouse is booked. (This weekend is also the nearby University of Idaho's Homecoming game). 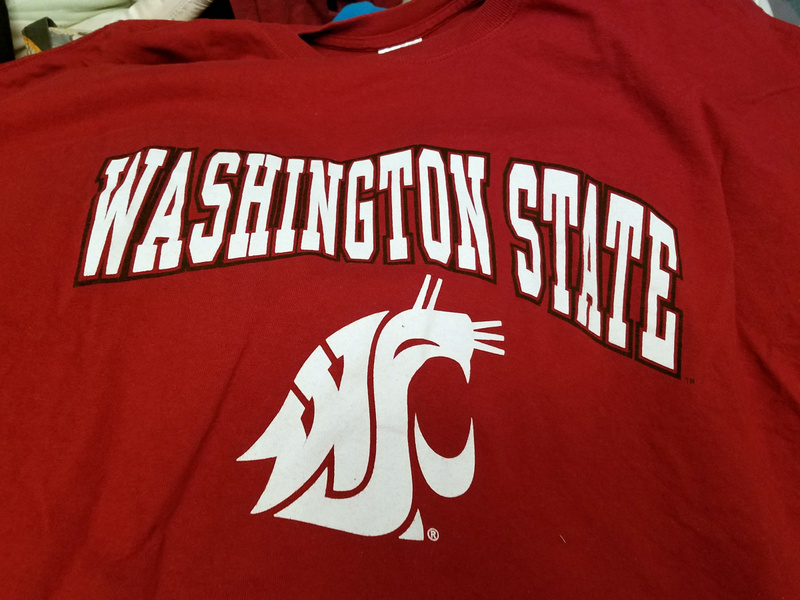 So, what should you do if you're joining the WSU fan festivities – or just planning to be in the general vicinity? 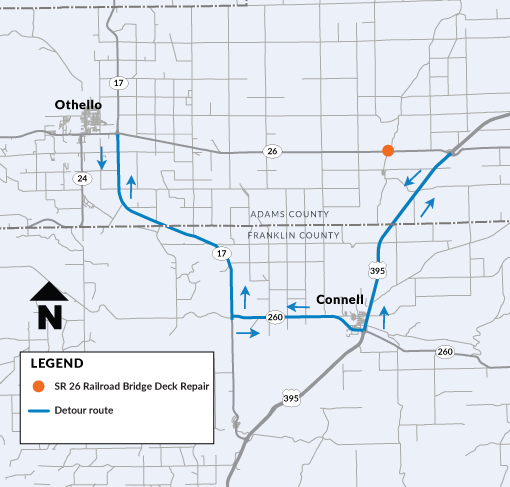 A detour on SR 26 near Othello will add an extra 15 minutes to one of the main routes to Pullman this weekend. With heavier than normal traffic expected please factor the detour in your travel plans. The best defense is a good offense – so know before you go. Use our online tools such as the @wsdot_east and @snoqualmiepass Twitter accounts, our travel alerts page and WSDOT app to stay in the know both before you head out and as you travel. (Never use an electronic device behind the wheel, ask a passenger or pull over to a safe spot). Follow these tips to keep yourself and other fans safe and so that you're there for Gameday and in the stands for kick-off yelling, "Go Cougs!" with 35,117 of your closest Coug friends (and a few Ducks that might waddle their way in). Freight touches every part of society every single day – from ensuring a farmer's wheat gets to market to helping a company get the parts it needs to build its products to ensuring the latest gadget is on the shelf when you do your shopping. None of these happen without freight traffic. 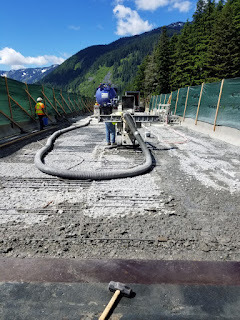 Repairs like this replacing the deck from North Bend to Summit Bridge in 2016 help keep all traffic flowing more smoothly on I-90 - including freight traffic critical to our state's economy. With our seaports, agriculture, aviation and high-tech industries, Washington is one of the most freight-dependent states in the nation. In 2017, Washington's gross business income for freight-dependent industries was $595 billion and those industries support more than 1 million jobs. Freight is vital to our economy and the movement of goods is one of our key transportation goals. We also know that freight haulers can face several special challenges, including federal limits on hours of work and finding adequate – and safe – places to park their trucks. With many freight haulers using Interstate 90, we know that roadway in particular needs to meet their needs as well as all other types of travelers. We wanted to share an update on several I-90 projects that improve traffic for freight haulers -- as well as all other types of travelers. All told from 2009 to 2027, we're scheduled to spend $912 million improving the roadway, adding capacity and improving safety. This work, done in stages between Hyak and Easton, adds a lane of traffic in each direction to meet projected traffic volume increases. Work also includes stabilizing slopes, replacing and repairing bridges and straightening some curves. This view from 2016 shows the first of two avalanche bridges on I-90, which allow snow from a historically active avalanche chute to travel under the elevated bridge and into Keechelus Lake instead onto the old roadway (shown at left). This reduces the number of avalanche control closures needed on this main freight route. This improvement elevated the highway at a historical avalanche site on the west side of Snoqualmie Pass, allowing snow, trees and other debris to flow underneath the roadway instead of on to it. This reduces the number of closures needed for avalanche control east of the pass or to clear the roadway and keeps traffic flowing. Chain up and chain off areas are being increased, making more room for larger freight trucks to allow drivers enough space to safely install chains before heading over the pass. A number of crossings are being designed to help wildlife move more freely thorough the corridor as well as to prevent collisions. The most noticeable is the wildlife overcrossing east of Snoqualmie Pass, but there are also a number of undercrossings as well that allow animals to cross without entering the roadway. Fencing will help guide animals to the crossing locations. The new wildlife overcrossing on I-90 will be complete this spring and is one of several improvement projects that will benefit freight traffic -- and all travelers -- by helping prevent collisions with wildlife that close the key cross-state highway. 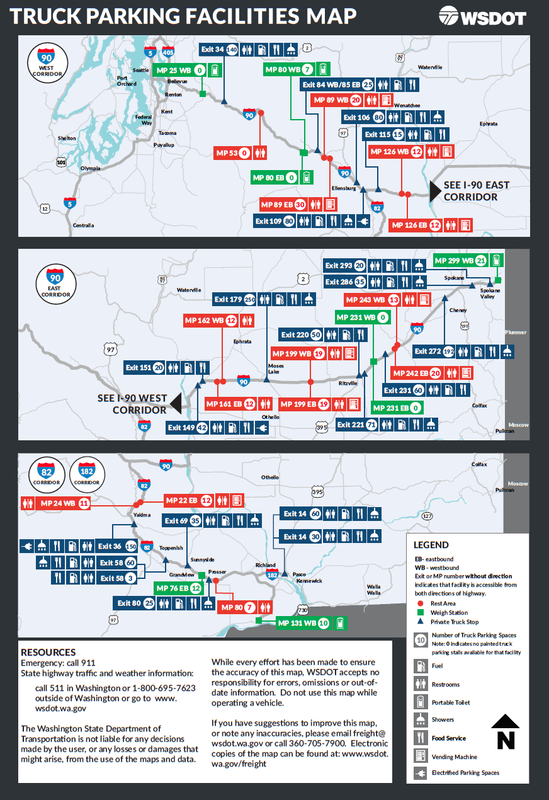 Extended rest area stays: Commercial truck drivers face strict restrictions on hours of work and mandated rest breaks and it can be difficult to find safe places to take those breaks (see truck parking maps below). Safety rest areas can be a good option, but state law limits stays there to 8 hours per day, two hours less than commercial drivers are required to rest before driving again. We're trying a pilot project of extending stays to 11 hours for commercial vehicles only. It's only in place at six rest areas right now, and we'll use those spots to evaluate how the change affects overall access and parking for all travelers. 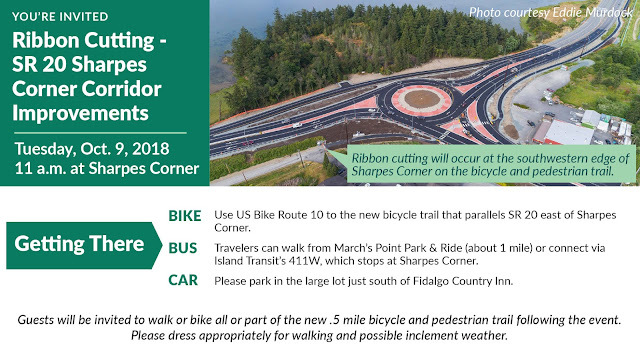 The rest areas in the pilot project are Smokey Point (north and southbound), Maytown, Scatter Creek on I-5 and Indian John Hill (both east and westbound) on I-90. Truck parking maps: An outgrowth of the 2016 Truck Parking Study, we produced these maps to aid truck drivers in finding safe and convenient places to park. Each location – including public and private options – includes details about number of parking spots as well as available amenities such as showers, restaurants or fuel. The maps are distributed at rest areas and other locations and also can be downloaded from our truck parking website. Truck parking maps help freight haulers find safe and convenient places to park overnight or during mandatory rest breaks. Several versions are available. It's exciting that we're only a few months away from the opening of the new State Route 99 tunnel under downtown Seattle. The tunnel will dramatically change the way people get around Seattle. There will be no mid-town entrances and exits like the Alaskan Way Viaduct has today. The tunnel's entrances and exits will move farther north near the Space Needle and farther south near the sports stadiums. Will your trip be shorter or longer? Better or worse? The answer depends on your destination. While we're excited about the opening of the SR 99 tunnel, it's important to remember that this is ultimately a safety project, not a congestion-relief project. The tunnel was one part of the plan to replace the aging Alaskan Way Viaduct, which was vulnerable in case of an earthquake. It is designed to work in combination with a new Alaskan Way surface street which will not be complete until 2021. Seattle traffic patterns will change at different points in time. There will be a big adjustment when the tunnel first opens and another shift when tolling begins, which could be as soon as summer 2019. Traffic patterns will finally settle when the new Alaskan Way surface street opens. The tunnel will be a more direct route for drivers who want to get through downtown. On the other hand, the tunnel will not have the same ramps to downtown at Seneca St., Columbia St., and Western Ave. as the current viaduct does. So we expect downtown traffic to shift away from the parts of downtown which had been connected to the current viaduct and shift towards the new tunnel entrances and exits in South Lake Union and SoDo. After the tunnel opens, we expect it will take a few months for traffic patterns to settle as drivers try out different routes to find what works best for them. While not everyone who uses the viaduct today will use the tunnel, we expect other drivers will find that the tunnel is a quicker option than the route they take today. Our traffic predictions show that before tolling begins, there will likely be more drivers using the tunnel during peak periods than use the viaduct today. There are about 5,200 vehicles per hour which currently use the northern section of the viaduct at peak times (6 - 9 a.m. and 3 - 6 p.m.). The tunnel could potentially carry as many as 7,000 vehicles per hour based on our traffic forecasts. The tunnel will be toll-free when it first opens, with tolling expected to begin as soon as summer 2019. The Washington State Transportation Commission has set toll rates ranging from $1 to $2.25 with a Good To Go! pass depending on time of day. Tolls will cause traffic patterns to change again. When tolling first begins, we expect the number of vehicles travelling through the tunnel to drop to between 4,000 to 5,000 vehicles per hour during peak periods. Drivers leaving the tunnel might choose to go to I-5, Alaskan Way, or local streets. We also expect a gradual return to the tunnel as more drivers create Good To Go! accounts and get a better sense of the value of the time they save by using the tunnel. We've seen this pattern on the SR 520 Bridge and other toll roads around the country. Ultimately, traffic patterns won't truly settle until the future Alaskan Way surface street improvements are completed in 2021. The new Alaskan Way is designed to work with the tunnel and give drivers multiple options to get into and through downtown. 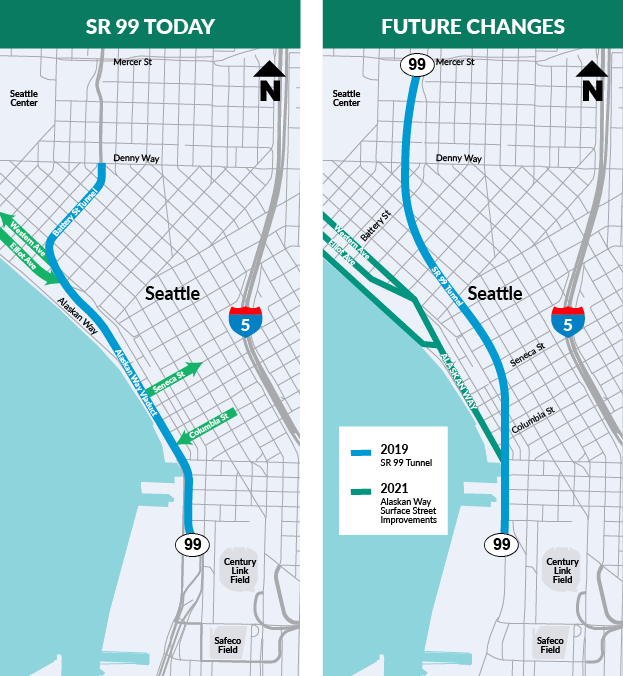 Overall, the two routes are expected to carry 5,000 to 6,000 vehicles per hour during peak periods and will work together to replace the function of the Alaskan Way Viaduct. Much like a weather forecast, these traffic projections aren't an absolute certainty but they do give us a glimpse into how traffic patterns may change over time. These projections are our best attempts to predict what people may choose to do based on a model of an extremely complex and constantly changing system. After the tunnel opens, we will continue to monitor traffic patterns and will give updates about what we see. Ultimately, the new tunnel, in combination with several other major construction projects, means that we can expect several years of change before traffic patterns truly settle down. We get plenty of questions about SR 18 over Tiger Mountain, especially following collisions. Unfortunately, there are no simple – or low-cost – solutions to improving the highway. At first glance, installing a center barrier seems like a straightforward and inexpensive solution. But there’s actually much more to it. A center barrier requires six feet – at a minimum – down the center of the highway. You need room for the barrier and a few feet of space between the barrier and vehicles. To make that happen, we would need to move traffic to the outside shoulders. OK, so, just do that, right? Well, again, it’s not that easy. 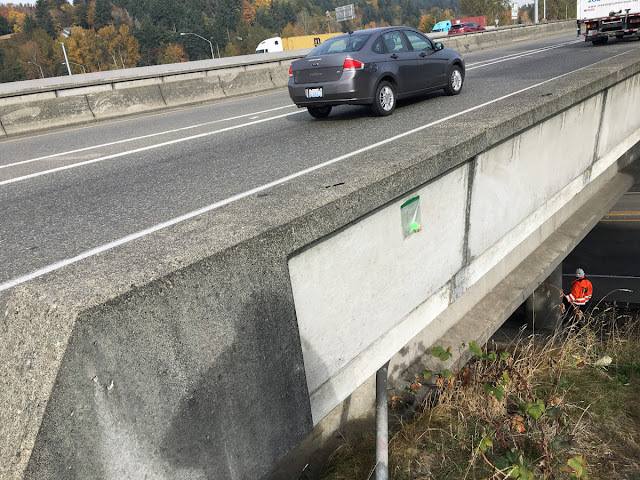 In many areas, SR 18 would need to be widened to accommodate the barrier, moving traffic to the existing shoulder and rebuilding the shoulder to become a lane. The shoulder as it is now isn’t paved to what is known as “full depth,” meaning it’s not built to handle the weight of traffic thousands of vehicles that would use it each day would present. We would need to excavate the existing shoulders to create a new roadway before traffic could drive on it. Even with this portion, several feet would be needed for a new shoulder for stalled or disabled vehicles to safely pull off the travel lanes. Sections of SR 18 would need to be widened in order to place a center barrier in the roadway. There are also several fish barriers – culverts or bridges that don’t allow fish to easily pass through the area -- along that stretch which would need to be replaced during a widening project, and several unstable slopes would need to be addressed. 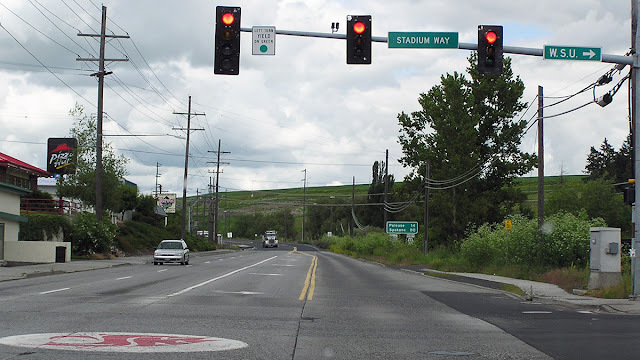 There also is no funding to widen SR 18 between Issaquah-Hobart Road and Deep Creek at this point. The Legislature has provided us $1 million to complete an initial assessment of how much it would cost to design and build a wider SR 18, and those funds become available in the next year. Once that work is done funding would be needed for the design work and construction. no funding has been provided for design or construction. There are no simple solutions to highway safety. We all play a role in making sure everyone stays safe on the highways. We’ll continue to work within the resources we have to enhance roadway safety and we hope motorists drive safely on the roads. As funding becomes available we’ll look for more ways to improve the highway system for all users. Every summer our agency welcomes college students into our internship program. They come from schools all over the country and are placed in our offices throughout the state where they gain experience in engineering, environmental and hydraulics, construction and traffic operations, among other things. It’s a fantastic opportunity for both the students to learn tangible skills and for our agency to help train future leaders. Erik Allen, Brittany Quan, Luke Erickson and Stephanie Gady spent their summer based in our Spokane office. Here’s a look at what they did. Left: Luke Erickson learned about surveying work as part of his internship. Right: Stephanie Gady and the rest of our Spokane-area summer interns found plenty to do and learn during their experience. Just about anything can happen in the field, Erik Allen learned. In school, he learned about design and planning, but one thing only experience can teach is how to think on your feet. Well, experience, and coming face to face with a black bear. Erik was off the road on State Route 21 near Republic in a ditch searching for a culvert entrance when a baby black bear decided to crawl out of the exact culvert he was searching for. Knowing momma bear wasn’t likely far behind, he made a beeline back to his truck. Despite his close encounter with a bear, Erik loved being outside on the job. “I got to spend a lot of time on stretches of highway in beautiful settings, breathing fresh air,” he said. Erik assisted with the inspection of projects like rumble strip additions, chip sealing, and sign placement. He learned how the safety, efficiency and success of a project depends on how well engineers and contractors work together. He recommends other students interested in engineering consider applying for an internship here. Real world experience showed Brittany Quan what she doesn’t want to do with her career, and pointed her in a new direction. After spending two of her three-month-long internship learning about reinforced steel, concrete and testing procedures in our materials lab, Brittany asked to move to a different department where she worked on designing hydraulic systems for highway drainage. That clinched it for her as she heads into her senior year. “I’m adding design classes to my schedule and switching my focus from materials to design,” she said. Brittany loved her time here. She said the people were easy to get along with and found the employees very willing to help the interns learn. In fact, she liked it so much she’s hoping to find a position with our agency during the school year. Oh, and she had some wardrobe advice for any future interns. Left: Erik Allen found himself face-to-face with a black bear during his internship. Center: Math was a big part of Stanford student Stephanie Gady's summer internship. Right: A summer internship made more clear to Brittany Quan what she does, and doesn't, want to do with her career. Stephanie Gady enjoyed being able to get hands-on experience in what might be her future career as a civil engineer. She said she was surprised at just how much time she got to spend in the field during her internship. Stephanie spent part of her summer learning to be an ADA ramp inspector, making sure that ramps were safe for use by people of all abilities. She also learned that there’s a lot of math involved with construction. She spent a lot of time working on a quantity calculations manual, which contains the formulas, mathematical vectors and conversion factors that are commonly used during the design and construction stages of a project. As an intern this summer, Luke Erickson learned everything from how to use certain pieces of equipment, how to communicate better, how contractors do their jobs, and about material properties, earthwork and structures. He spent time both in the office using drafting and design software, and in the field working on passing lanes, bridge deck repairs, and the new 10½- mile North Spokane Corridor running through downtown Spokane. “There was hardly ever a dull moment,” he said. The heat and the long hours came as a surprise (we warned him!) but said the experience showed him he has picked the right career. Luke plans to become a licensed civil engineer, and eventually design and inspect his own projects. He’s interested in structural, transportation, and water resources engineering. Our internship program offers many options for students. Many of our interns have gone on to careers with our agency and still others have moved on to work for cities, counties or construction companies. Most of our internships begin accepting applications in February so keep an eye out on our employment page! We’ve made great progress to Revive I-5 in the Seattle area this year, but we still have one more weekend-long lane closure on northbound I-5 set for Oct. 13-14. After that, we plan to complete the rest of the work during overnight shifts. I wish I could tell you that this is the last of the major closures on I-5 for a few years, but that’s not the case. Parts of I-5 are almost 60 years old now, and most have had only routine maintenance. As we’ve been saying about projects for the past few years, it’s time for a major rehabilitation effort. So far, we’ve completed major repairs on I-5 northbound and southbound south of Seattle. Those are a good start, but it’s only the beginning. In the next 10 years, in King County alone we have more than 25 projects that are planned. This includes more than a dozen paving and expansion joint projects in both directions of I-5 in King County and more than a dozen safety and maintenance projects. 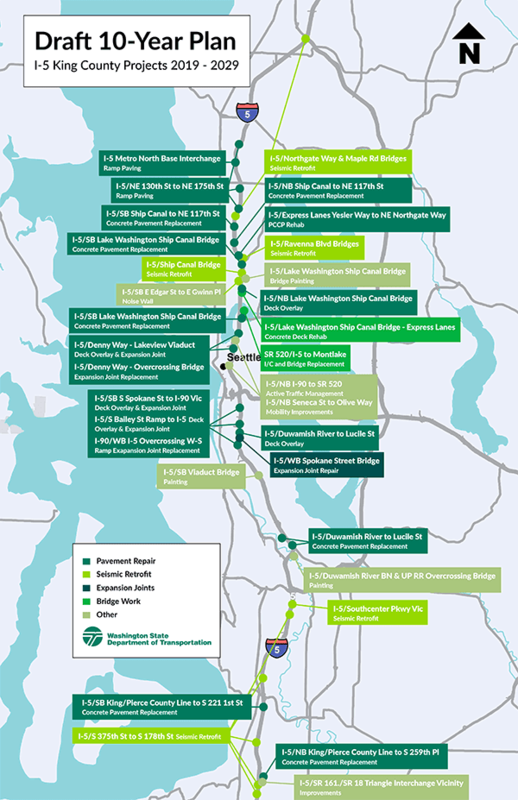 More than two dozen projects are proposed to Revive I-5 in King County during the next 10 years. And this is only the work on I-5 in one county. 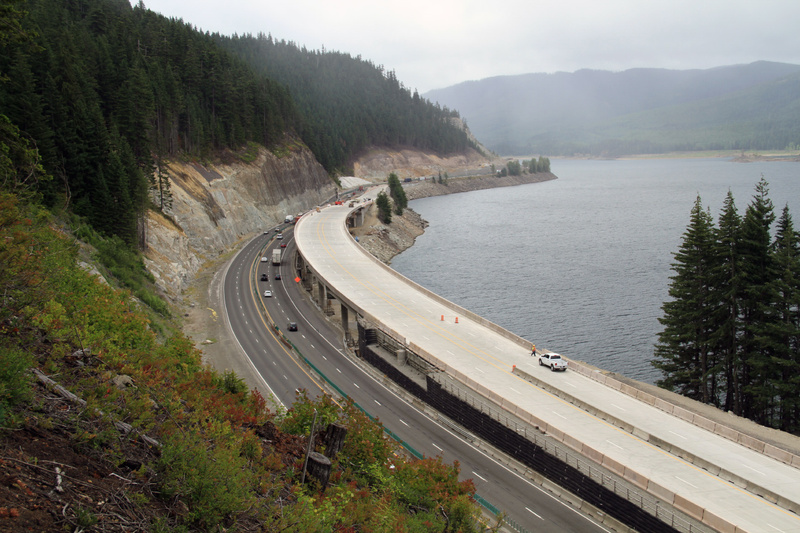 We’ll continue doing projects on highways across Washington to keep them in a state of good repair. We have southbound projects to replace aging expansion joints and paving the bridge decks. We will replace more than 4 miles of concrete across all lanes in both directions of I-5 between 117th Street and the Ship Canal Bridge. This can’t be done with just weekends. It will require weeks of lane closures, similar to a project we did on northbound I-5 south of Seattle in 2007. We’ll only work in one direction at a time, but people are going to want to use alternatives. We’ll repave both directions of the I-5 Ship Canal Bridge, which will require extended lane reductions. We have several projects that will replace damaged concrete panels, grind concrete to eliminate ruts and repave asphalt. These may require weekend-long lane reductions. We have five projects planned that will reinforce key bridges and overpasses to withstand earthquakes. You may look at this and think, “Wow, that’s a lot of work. Why did you put it off until now?” I-5 has held up much better than the original designers expected. When the interstate in Seattle opened, its estimated pavement lifespan was 25 years. The concrete pavement reached well into its 40s before it began showing signs that it would need major rehabilitation. 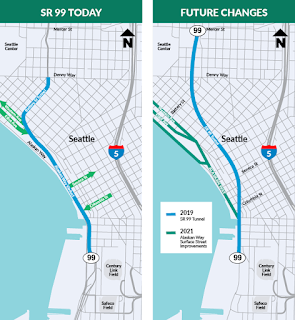 While plenty of work has been done to Revive I-5 in the Seattle area over the past couple years, a lot more work is planned for the highway in King County over the next decade. Our engineers closely follow the condition of the interstate – and all state highways – and make decisions about which areas are most in need of repair, and which can wait. We don’t have a full schedule for all of the work needed during the next 10 years, but our team will prioritize the work based on the condition of the highway and available funding. It will take another 10 years, but when we complete these needed repairs, I-5 in King County will be in good condition for decades to come. For some of our road workers, just getting to where they need to be can be dangerous. 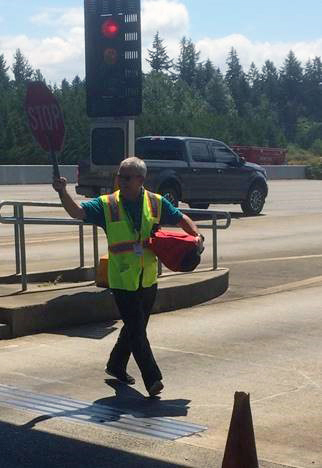 Take Paul West, who has worked in our toll plaza on the Tacoma Narrows Bridge for 11 years. West, like all of our toll collectors on the bridge, have to get to their assigned booths while dealing with vehicles moving on SR 16 at 60 mph or more. he heads to his toll booth. West knows that the safety of him and his co-workers as well as everyone else on the road is dependent on drivers being focused and alert. "I've seen rear end accidents from people being distracted by their phones or trying to get their money out to pay the toll," he said. "But in the last 11 years, there hasn't been a single injury to our toll collectors." Toll collectors follow a procedure that to get to their toll booth. They wear a safety vest to cross the lanes, and have a fellow toll collector hold up a stop sign or their hands and use their voice to signal to drivers to stop. "Toll collectors cannot cross the lane until drivers come to a complete stop," he said. "Sometimes we get complaints about our stopping procedure, but it's what we have to do to be safe out here." Keeping toll collectors and other drivers safe comes down to drivers slowing down, being alert, ignoring distractions, and having toll payment within an easy reach. 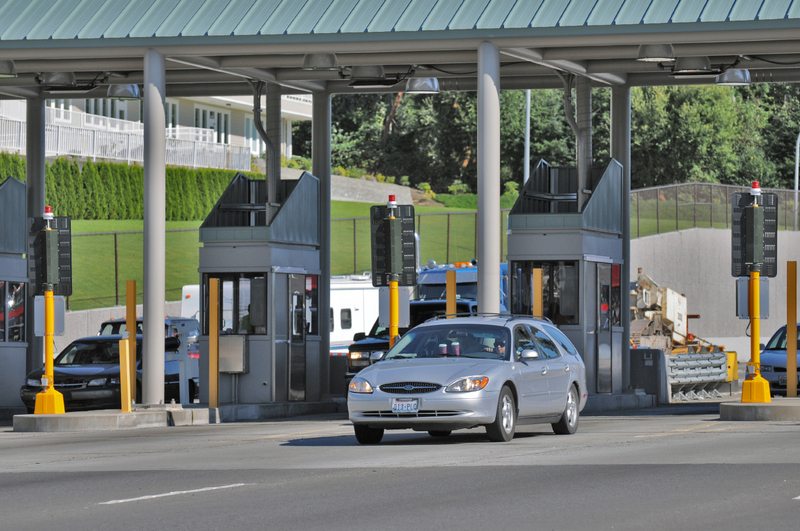 Vehicles on the Tacoma Narrows Bridge must be alert near the toll plaza to keep toll workers and other drivers safe. "Slow down immediately after you pull off of Highway 16," West said. "Be aware that you are pulling into a safety zone equivalent to that of a rest stop. Pay attention to what toll lanes are open or closed, and keep your eyes on the road." When not manning his toll booth, West likes to stay busy with projects around his house and is an avid runner. He has two daughters, and his first grandchild is due in November. West can't wait for his days off to be spent babysitting his grandson come this fall. Please help him and all road workers get home safely to their families by always being alert, slowing down and giving them room to get their jobs done.